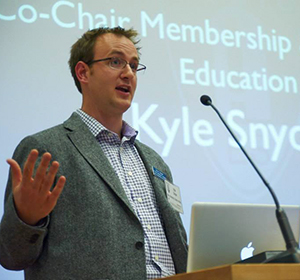 Kyle P. Snyder is an educator, engineer, and consultant dedicated to the advancement of audio education for engineers at every stage of development. He is a faculty member within Ohio University’s School of Media Arts & Studies where he routinely teaches music production, recording, mixing and mastering, critical listening, sound design for film and video, and live event production. Snyder is also the Associate Director of Ohio University’s High School Media Workshop, a unique opportunity which affords budding media creators the chance to test the waters for a few days while learning the latest techniques in audio & music, video, animation, and social media. Professionally, Snyder is active in numerous organizations, including the Audio Engineering Society which he serves both internationally and locally. He is also proud to host and engineer the AES Journal Podcast, produced ten times each year in conjunction with the Journal of the Audio Engineering Society. Additionally, Snyder is a member of The National Academy of Recording Arts & Sciences, The Society of Professional Audio Recording Services, The Association for the Study of the Art of Record Production, and the Music & Entertainment Industry Educators Association.